Inside Voice: Hi, my name is Ariel. I'm addicted to ironman. Hi, my name is Ariel. I'm addicted to ironman. Ironman Wisconsin. 2.4-mile swim, 112-mile bike, 26.2-mile run. September 10, 2006. Around mile 8 or 9 of the run, plodding along a muddy path through puddles under a quickly darkening sky, I had the thought that was I was doing was ridiculous. I am running a marathon, I thought, at night, in the rain, having ridden my bike 112 miles and swum 2.4. Who on earth does this for fun? by choice? and pays lots of money for the privilege? Me, that's who, and a lot of other people. Strangers who became friends over the course of 17 hours on that day in Madison. That's an experience that not many people get to have. I spent the entire summer worrying about heat. Last year's IM Wisconsin saw record temperatures and a record rate of drop-outs -- close to 19% of those who started did not finish. This summer I had a few really tough rides in heat which made me doubt my ability to finish the ironman in hot conditions. 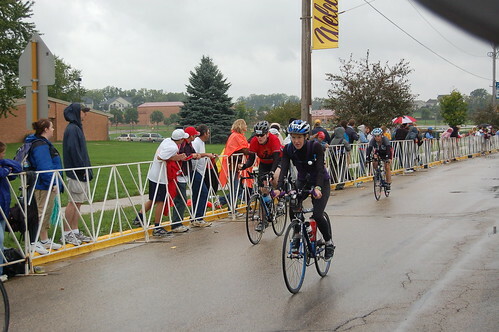 But none of that mattered, because race day dawned on cloudy skies, light drizzle, and 50-ish-degree temperatures. 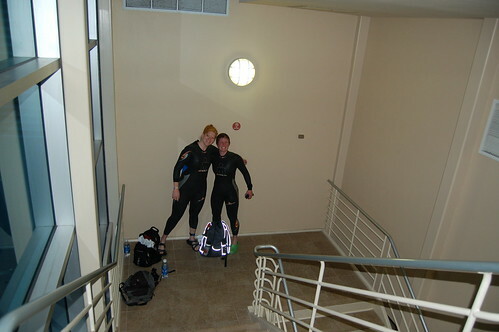 The Monona Terrace conference center, which housed all the transition areas, was too crowded with shivering athletes for us to squeeze inside, so we found some empty stairwell space in which to put on our wetsuits. Marissa and I got into the water to the strains of the predictable race-starter hits by Coldplay and U2. The lake water was warmer than the air outside. Marissa, a longtime swimmer, went straight to the front of the inside buoy line; I seeded myself somewhere in the middle, which was dumb. I exchanged good luck wishes with the other racers and then the cannon went off. (Earlier I had heard a little kid asking a parent, in wonderment, "Do they shoot a real cannon into the lake?" and I chuckled at the thought of a cannonball taking out a few swimmers.) I braced myself for the crush of swimmers and reminded myself that it would pass in five or ten minutes. But I got all the way to the first turn, fifteen minutes in, and the violence did not subside. In fact, at the first buoy, the swim was so crowded that we all came to a complete stop like cars in rush-hour traffic. The mass of elbows, legs, and fists continued for the entire first lap. I didn't get to take a complete, unimpeded stroke until the second lap of the swim. By then, the swells on the lake had really picked up, and the final leg of the swim was like swimming against ocean waves. That was fine with me, since I have plenty of experience swimming in the SF Bay. But it did slow us down a bit. I have done three IM-distance swims within a minute of 1:18; on Sunday, I got out of the water in 1:21. The wetsuit shuckers peeled off my wetsuit and I jogged up the dreaded helix -- the four-story spiral parking-garage ramp that led up to T1. I glanced at my HRM and saw that my heart rate was 174. Oy! But no matter. The helix and the fourth story of the garage were lined with screaming spectators. It was unreal -- seriously, I imagine this is what running the Olympic marathon is like. When I got to the top level, it was cheering fans the whole way across. Awesome. I ran into the conference center, grabbed my bike bag, and changed into dry clothes. I had a cycling vest in my bag, but I left it in there when I heard a volunteer say it was warming up outside. WRONG!!! It was in fact getting colder and wetter by the minute. I should have put the vest on; I always could have shoved it in a jersey pocket if I got too warm. Lesson learned. I put on shorts, a jersey and arm warmers, my helmet and shoes and socks, and ran out to get my bike. My transition time was pretty long since they had us running up four stories of the parking garage, then back out the whole length of the garage for our bikes. As I ran to my bike, I saw Dave and his parents, who had driven up from Chicago to spectate. My fans! Sweeeeet! Volunteers grabbed my bike for me and I headed back down the helix on the opposite side of the garage. I had been dreading this bike ride alllllll summer. I have no fear of the swim or the run, but for some reason this bike ride was scaring the bejesus out of me. I knew it would be hilly and I didn't want to spend 8 or more hours out there. My goal was to do the entire thing without stopping, without unclipping from my pedals even once, which is what I did at my first ironman in New Zealand. Well, that goal went out the window when I dropped my chain on the first really steep climb, but no biggie. My reason for having the goal was to minimize non-riding time. At the Vineman Aquabike, I crashed, flatted, and then stopped three times to wait in line for porta-potties, and I estimated I spent 40 minutes off the bike. What a waste of time! So 30 seconds to fix my chain was not a huge failure. I also stopped briefly to grab my special needs bag, which contained my fuel for the second lap plus a spare tube. Other than that, I did not stop. The steady rain helped disguise the fact that I was, uh, not stopping to use the porta-potties. The Wisconsin bike course is pretty tough. I live in San Francisco so I know hills, and this bike course had some short, steep ones that reminded me quite a bit of home. I was glad that I decided at the last minute to ride my road bike instead of my tri bike (the road bike has easier gearing). The course was beautiful, with rolling farmland, grain silos, endless cornfields, and pretty climbs through tunnels of lush greenery. Most of the climbs were lined with hardy spectators juggling umbrellas and soggy cardboard signs. To keep myself from despairing on the long bike ride, I did my best to think of the course in terms of 15-mile chunks. I rode aid station to aid station. At the halfway point, I was elated, because I knew every time I climbed each hill I'd have it behind me for good. I cheered out loud for myself when I got to mile 80. I was amazed at how good I felt, considering that I hadn't done a long ride in four weeks. And I was thrilled that my ribcage injury was not giving me grief at all. I rode the first half in 3:30, and expected to lose maybe 15-20 minutes in the second lap, for a total time of 7:15-7:20. But as the day wore on, it got windier and rainier. The final 13 miles were straight into a headwind. And also uphill. I do not kid. I was going under 10mph for that last long stretch. So I finished in 7:40. But... not the 8 to 9 hours I had feared going into the race. 7:40 was just fine with me. At the end of the ride, we had to ride BACK UP THE FOUR-STORY GARAGE RAMP. Oy. At the top, a cheerful troupe of volunteers waited to take our bikes and usher us into the conference center to change for the run. Oh, the relief of getting off the bike. The sweet, sweet satisfaction of getting off that damn contraption. I generally like riding my bike, but I am always so happy to get off of it in a long race. I entered T2 through another tunnel of screaming spectators. Inside the women's changing room I found absolute carnage. Women were sitting wrapped in towels and mylar blankets, shivering uncontrollably, drinking hot chicken broth, trying to get warm. A few people were sitting on the floor, dejected, wrapped in blankets. I found someone's used towel on the floor (ehhh... gross, trying not to think about it) and used it to wipe the road grit off my pruney, soaking-wet feet. It didn't seem like a great idea to run a marathon with feet coated in sand. I was not prepared for a cold run -- I had only packed shorts, a short-sleeved shirt, dry socks and shoes and a visor. So I kept my wet cycling arm warmers on, and got a garbage bag from a volunteer. I poked my head through the top of the bag and headed out of the nice warm room back into the rain. Immediately I saw my Taper Madness friend Rhonda, which was a big happy surprise. (She registered for 2007 the next morning!) With her cheers still in my head, I headed out onto the run, wearing a garbage bag and cycling arm warmers, sloshing through the rain and feeling pretty good. Still happy to be off the damn bike and onto the run already. The run is familiar territory. I know that whatever happens, I can pretty much keep moving forward. I knew I could run the first half without stopping. The run took us on a winding course through downtown Madison, looping around the astroturf of Camp Randall stadium (home of the UW Badgers -- I went to a rival Big 10 school, ahem), and onto gravel trails on the University of Wisconsin campus. Lots and lots and lots of turns. Easy to get lost, especially in the dark. And it was getting very dark. Around mile 8, and again at 21, there was a chip mat and a giant light-up billboard. Back at race headquarters, fans could enter personal messages to runners to be displayed here. When I crossed the mat, I saw "#2273 - ARIEL - YOUR HAIR LOOKS CUTE!" Dave did not disappoint. I did make it to the end of the first lap without walking (except briefly at aid stations, and at the special needs bag stop, where I picked up the long-sleeved t-shirt I had left there that morning for the second half of the run "just in case" it was cold at night, ha ha ha). I saw Marissa once on the first lap and wanted to say so many things to her about the day and about how great she looked, but all I could manage to blurt was a "Heyyyy!" The run turnaround was cruelly halfway down the finish chute -- just a few strides from the brilliantly lit finish line, we had to turn around to start lap two. Tears welled in my eyes as I turned away from the finish. I kept running until after mile 14, where I had seen Dave and our Madison friends Dave and Rebecca. Around mile 15 I allowed myself to walk. Here's the thing about the ironman run: you really want to stop and walk. After the first few miles, every single step is painful. The biggest part of the battle is keeping yourself running. Honestly, given enough time, almost anyone can walk the marathon in an ironman. But it hurts like hell to keep running. And for me, challenging myself in the face of pain is the whole point. So I'd run as long as I could tolerate, then reward myself with 30 seconds of walking. Run four traffic cones... walk two. Run to the second tree... walk to the third one. And so on, for the last 11 or 12 miles. I passed a lot of people in the second half, although I slowed down quite a bit myself. It seemed absurd at times. By my second lap, the sun had set and the sky was completely dark. Parts of the run course had no lighting. We were running in the dark, in steady rain, slogging through mud puddles along the shore of Lake Mendota. Giant lights on generators provided illumination every few hundred yards, but for the most part it was an exercise in solitude and darkness. Other runners provided company, but almost no one was going the same pace. Every mile there were volunteers offering Coke and warm chicken broth (yummmmm) and cookies and power bars and fruit, but the spaces in between seemed to get longer and longer. I must have been drinking too much, because it seemed like I stopped at every aid station to relieve myself. Every time I stepped into a porta-potty, it felt like it was rocking like a boat, but it was really my head that was spinning every time I stopped running. Around 9pm I accepted a glow-in-the-dark necklace from a volunteer. I wore it like a crown around my head. The whole time I kept telling myself, you will get to the finish, just keep moving forward. That was my mantra for the day. Just keep moving forward. A little bit at a time, through the darkness and rain, I made my way back to the finish line. At the halfway point I had hoped to finish under 15 hours, but by mile 23 I knew I'd come in much sooner unless I had a complete collapse. Keep moving forward. You will get there. A mile from the finish, I could hear the announcers announcing finishers by name. Tears again welled in my eyes. 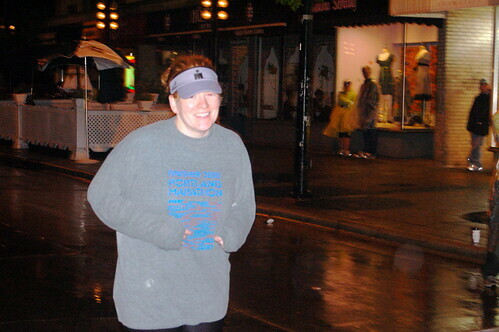 I took off my extra t-shirt (2000 Portland Marathon!) and tried to clean up a bit for the photo - ha. My paper race number had long disintegrated so I held it in my left hand so I had some hope of getting a finisher photo. And I headed down that chute for the last time. The lights were blinding and the crowd was huge and loud despite the rain. The blaring music and the announcers calling me home with "You are an Ironman!" was muffled -- I couldn't hear a thing. I was just so so relieved to be done. So relieved. I held up three fingers for three Ironman finishes as I crossed the line in 14:40:59. A couple of volunteer "catchers" grabbed my by the arms and walked me through the finish area. I got my medal and my bag of finisher goodies (t-shirt, bumper sticker, hat), some more chicken broth and some water. They asked me questions and made sure I was OK before letting go their vise grips on my arms. Good folks. I found Dave and his parents and a very happy Marissa, who had finished strong exactly an hour ahead of me despite having some major blister issues. Dave got my dry clothes while the two of us huddled in the food tent for warmth and exchanged stories with each other and the other racers and volunteers. 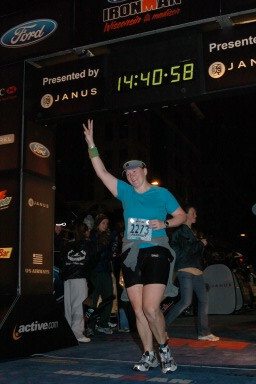 The funny thing is that now, when I think about the race, I fondly recall those last few miles in the dark and the wet. I remember the pain of every step in my hips and quads and feet. All week I kept telling Marissa that I couldn't wait for the race to be over. But I almost wish I were back there now, experiencing the solitude of the last few soggy miles before exploding onto the stage of the finish line. Keep moving forward. I felt so... alive. And now, of course, OF COURSE, after pretty much dreading this race all summer, I am sad that it's over. And I am trying to decide which ironman to do next. It is a sickness, I tell you. It is an addiction. The spectacle, the crowds, the plastic athlete wristband on my arm, the announcer Mike Reilly whooping it up at the finish line like a revival preacher (thanks, Dave, for that perfect analogy), they are all like heroin to me. I just can't get enough. It's hard to come down from that high. Marissa and I made a pact that we would do no ironman races in 2007. So... 2008 it is. Canada, anyone? i couldn't be more proud of you, ariel!! Congratulations on a fantastic race. From reading other race reports it sounded like a tough, rough race. You're amazing! I too could not be more proud!!! By the way, the buzz phrase from my tri club after this race was "cold induced diuresis" ie the fact they we were peeing like every half hour because our bodies were cold. Finally got a chance to read this. Yes, it sounds like a sickness alright. At least wait a few weeks until the memory of all the pain is distant before you start hankering to do another one. Great job though, I can't imagine a race like that in those conditions. You don't know me. 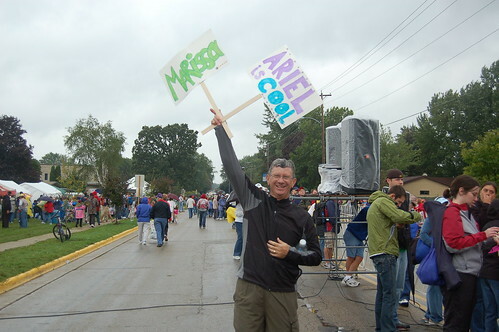 I'm from Illinois, and I was there watching some of my friends (I'm doing Ironman-FL on 11/4/06). 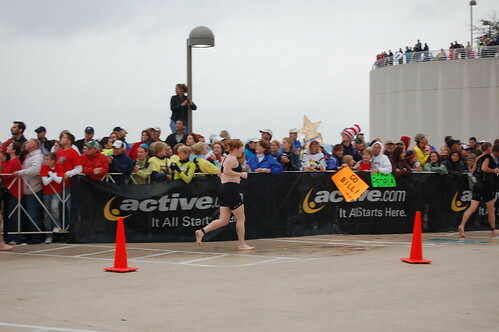 I'm actually in the picture of you in T1 on top of the Helix (white sweatshirt w/Green PEORIA sign). I noticed you on race day, and saw you several times on the run. You (specifically) were an inspiration as you just kept going all through the day and night. Thanks for writing such a great story about your Ironman Experience. I haven't done an Ironman distance since 1994. Your story has me so pumped up and ready to go.